Located in the heart of Syracuse’s Armory Square, Mulrooney’s is the oldest and one of the best known bars in this historic district. 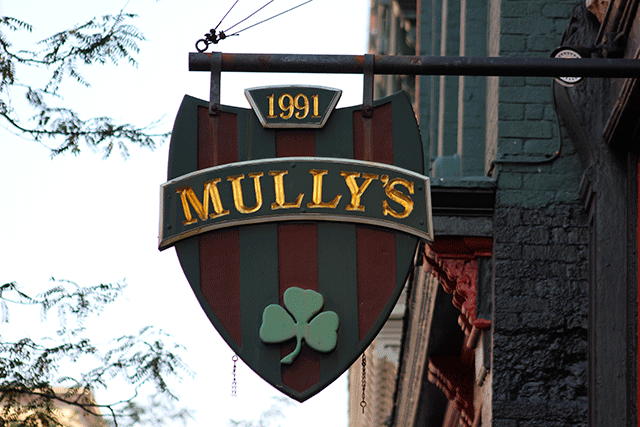 In fact, though founded in 1991, Mully’s has a historic note that reaches as far back as Syracuse has been on the map. Mully’s is not only an Irish pub, it is the Square’s only Irish sports pub. With televisions located in all corners you’ll catch every play of the biggest games. Mulrooney’s is the Official Home to all Le Moyne Lacrosse alumni. In fact, Mully’s even had the honor of hosting the celebration for the National Champion Le Moyne Dolphins Lacrosse team. At Mully’s, we take our sports very seriously. In addition to our spacious interior, double-bars, booths, tables and plenty of bar stools, Mully’s has the oldest outdoor courtyard in Armory Square – the ideal location for a drink during the wonderful Syracuse summers and many drinks have been enjoyed by thousands of patrons. Our mission at Mully’s is to provide a safe, clean environment where adults can gather to talk, party, and enjoy themselves. We take pride in our professional staff, excellent service and especially our icy cold beers and cocktails, and we’ve been doing it longer than anyone else in the Square. So join us, tip a few back and have good time, you won’t be disappointed.